(Nanowerk News) Tests for identifying genetic variations among individuals, which can be used to develop precisely targeted drug therapies, are a current focus in the emerging field of pharmacogenomics. A*STAR researchers have now developed and patented a customized and elegant nanoprobe for assessing sensitivity to the drug warfarin ("Nanoprobe-based genetic testing"). To develop the nanoprobe, Jackie Ying at the A*STAR Institute of Bioengineering and Nanotechnology and co-workers in Singapore, Taiwan and Japan devised a relatively simple procedure that uses standard laboratory equipment and can be easily adapted for other genetic tests. “Our method is faster, more cost-effective and more accurate than existing alternatives,” says Ying. Ying’s method detects genetic variations known as single-nucleotide polymorphisms (SNPs) that differ in only a single-nucleotide building block of DNA. In the case of warfarin — the most frequently prescribed anticoagulant — there are SNP differences in specific parts of the genome that indicate whether a patient will tolerate the drug or suffer serious side effects. The researchers used gold nanoparticles attached to short sections of DNA that bind to specific complementary sequences of DNA through the base pairing that holds together double-stranded DNA. These nanoprobes were exposed to fragments of DNA that had been cut out and amplified from a patient’s genome. 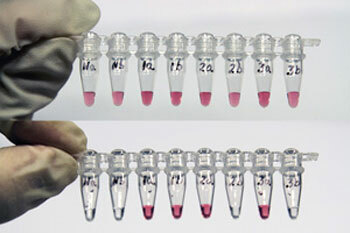 The nanoprobes are initially pink due to surface plasmonic effects involving ripples of electric charge. When analyzed, if the probes do not bind to the DNA fragments, they aggregate and become colorless on exposure to a salt solution. If they do bind to the target, they will not aggregate but will remain pink until heated to a ‘melting temperature’ at which the base pairing is disrupted and the DNA strands of the probe and the genome fragments separate. For cases of partial complementarity — in which the fragments are mismatched by a single nucleotide — the melting temperature is lowered by an amount depending on the level of mismatch. This allows SNPs to be detected through their different melting temperatures. The resulting color change is easily visible to the human eye but can also be evaluated automatically (see image). The system can also distinguish between homozygous genotypes (where a person caries the same SNP on each member of a pair of chromosomes) and heterozygous genotypes (where a person carries different SNPs on each chromosome).